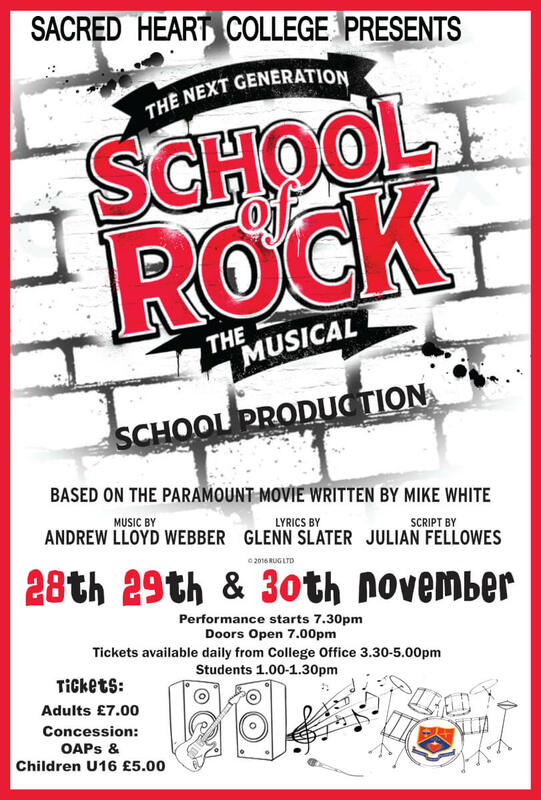 Sacred Heart College is delighted to present School of Rock - the musical, with music by Andrew Lloyd Weber and lyrics by Glen Slater. Rehearsals have been rocking since the end of August. We are delighted to welcome back many of our esteemed past pupils to assist in the production. Keelan Pritchard comes back to take the lead as Dewey Finn. Keelan played Brit in our last musical “We will Rock You”, and since that show he has had a wealth of experience on the stage, playing Val Jean in Les Miserables in The Millennium Forum in Derry. He has also acted with Omagh Players, Clanabogan Drama Circle and in the Strule Arts Centre pantomines, as well as performing on the local circuit as a singer. Our female lead, a current year 13 pupil, Clodagh Greene, plays Ms Mullins. Clodagh is also no stranger to the stage as she has been leading lady in many shows for Much Ado Stage School, such as Joseph for which she was the narrator and she played Sandy in Grease. Supporting the young cast we have Joanne O’Neill McCausland who is Choreographer. Joanne currently runs a very successful dance school in Omagh ‘Dance Revelation’. As a past pupil Joanne is delighted to return to Sacred Heart College to take up this role. Niamh Simmonds has also returned to Sacred Heart College as Stage Manager. She is currently employed with Hazel Wand theatre school. Gerarda McGlone an excellent past pupil with an abundance of creative ability and a graduate of Ulster University has done the photography for the programme. She now has her own photography business locally. James Strawbridge, who left Sacred Heart College in June 18 and is currently studying music in Ulster University will ably assist and play guitar in the band. Although all year groups in the school are represented across both cast and choir there is a particular focus on nurturing the outstanding talents of our Key Stage 3 pupils. The show runs on Wednesday 28, Thursday 29 and Friday 30 November, tickets are available from the school office from 3.30 – 5.00 pm.